Cosmetics can be purchased from the MineHeroes Store. - Access the GUI by typing /pets ingame. - Access the GUI by typing /particles ingame. -Access GUI by typing /titles ingame. - Access the GUI by typing /emotes ingame. - Access the GUI by typing /suits ingame. - Access the GUI by typing /hats ingame. 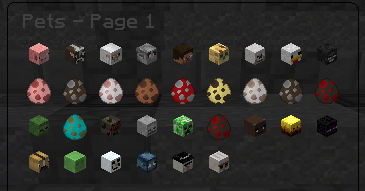 /disguise (name) (baby) - Disguise into the baby version of the entity/mob you have access to. Badela, dan_b, BasicallyLouis and 3 others like this.